From purely modern to traditional style, combining glass, slate, wood and tiles, our favorite top 10 bathroom designs will make you start renovating today. The master bath, of a 110-year-old renovated barn house in Long Island, is light and spacious, sheathed in dark slate floor tiles. 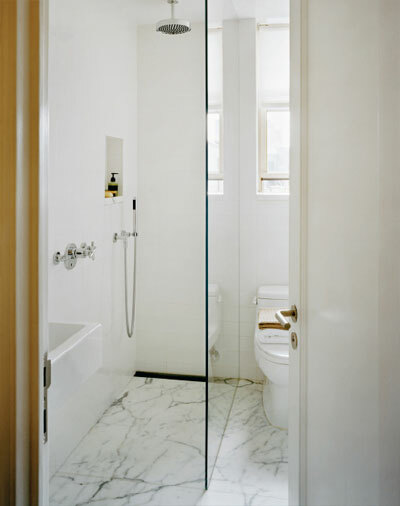 Statuary marble add a touch of style to the white ceramic tile walls of this tiny bathroom; a clear glass partition divides the shower from the rest of the space – Not an inch wasted in this New York City apartment makeover. 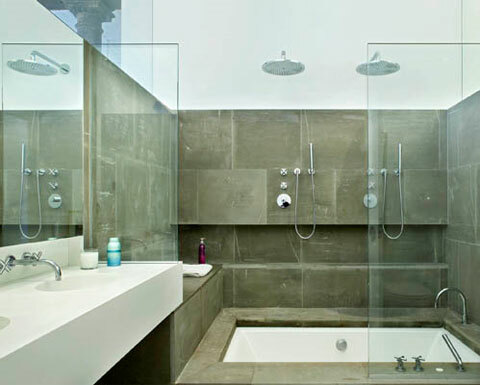 Modern industrial NYC loft space features a master bath with a large convertible tub/shower, where a teak slat floor can be removed to reveal a large soaking bathtub. Dark tiled bathroom design, in a family home on Lake Joseph, Ontario, featuring a single spotlight to light the shower space while a crystal chandelier provides the perfect ambiance for a bubble bath. Beneath a skylight the bathroom resides in a central glass box wrapped by a staircase of a small two-story house in Tokyo, Japan. 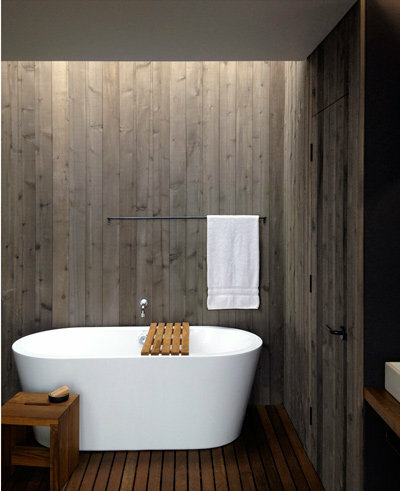 Warm wood tones and clean white fixtures adorn this minimal bathroom of a weekend retreat in Washington. 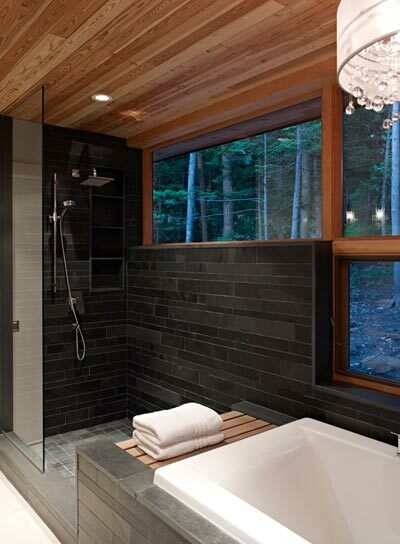 A skylight above the bathtub adds natural light and loads of ambiance. 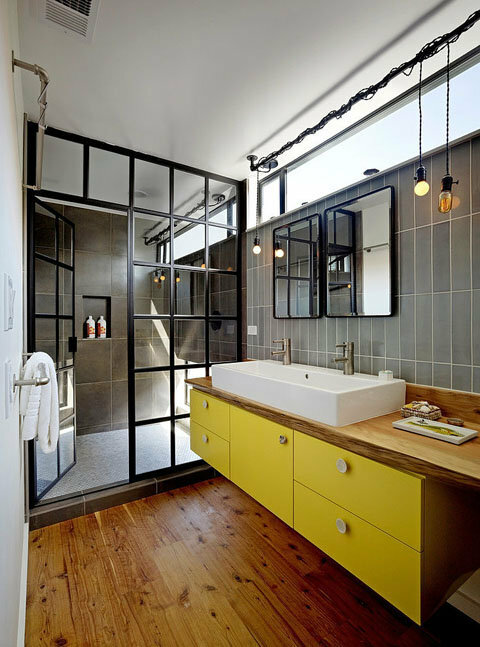 The main bath, of this stunning floating home in San Francisco, California, is awash with glass, black, battle ship grey, wood, and a wake up pop of yellow. Flooded with daylight from perfectly placed windows, you’ll still have all the privacy you want. At first glance, the bathroom of this New York loft space seems quite ordinary. 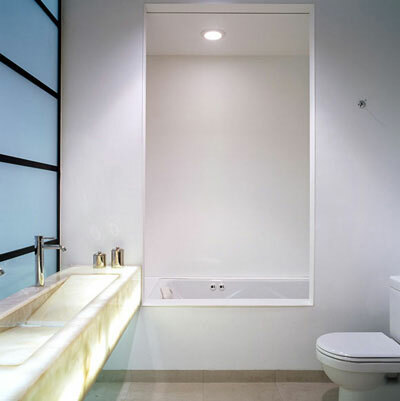 However, if you linger you will notice a solid onyx sink, lit from below, and a bath tub area lined in solid Corian, almost like a bath room inside the bathroom. 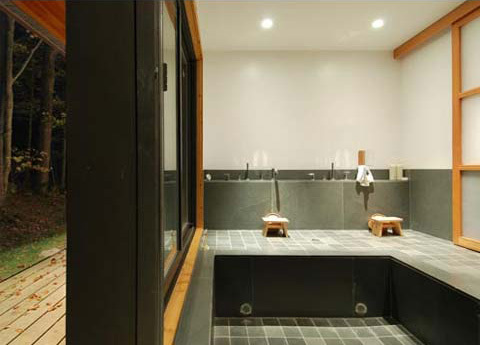 Inspired by Japanese culture, the owners of a modern lake cabin in Ontario, Canada decided on a bath house with a large sunken bath and floor-to-ceiling glazed openings to fully immerse in the tranquil beauty of its natural surroundings. Incorporating art into your bath room is a wonderful idea. 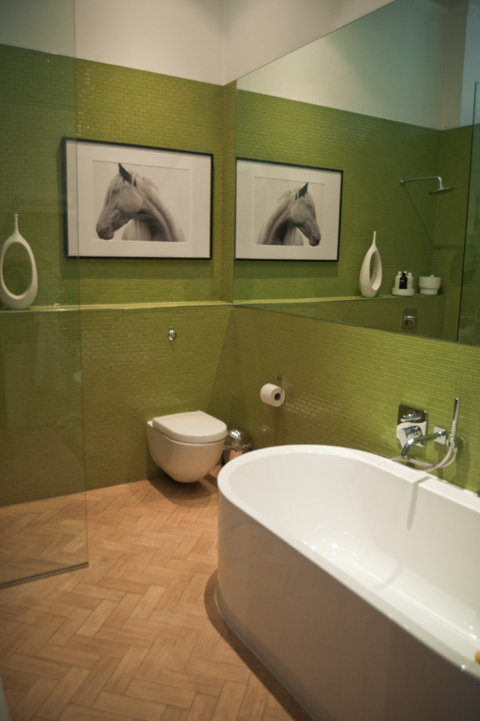 Just look at this London family home green-tiled bathroom with a beautiful black & white photograph of a horse admiring his reflection in the frameless mirror.